Translator’s Note: The Fragrant Board is probably better understood as a ‘Fragrant Sword’, or even ‘Fragrant Stick’, which is used as a symbol of ‘discipline’ within the Ch’an monastic community. Although primarily applied to ordained Ch’an monastics, it is also applied to lay-Ch’an practitioners who participate in Ch’an Week Meditation Retreats administered by monastics within temples and monasteries. Strictly speaking, it is not a method of punishment in the conventional sense as although a ‘sword’ in shape, it possesses no sharp-edges. It is a sword designed to ‘cut-through’ all delusion so that the empty mind ground is fully revealed to the Ch’an practitioner. The Fragrant Sword upholds the Vinaya Discipline and the Dharma, whilst functioning as a medical aid to the Ch’an practitioner. The Ch’an master knows exactly how to strike the Ch’an practitioner on the exact acupuncture points along the shoulder area, so that the qi energy is unblocked, and the practitioner is refreshed in both body and mind. As it reveals the fundamental reality as taught by the Buddha, it is also sometimes referred to as a ‘Dharma Sword’. He who wields it must possess a mind completely free of greed, hatred and delusion, or will not be considered qualified to make use of it. 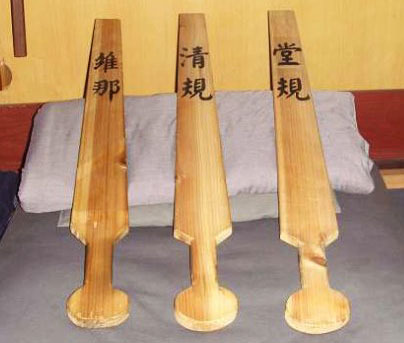 The wooden board (木板 – Mu Ban) is shaped like a double-edged sword (宝剑 – Bao Jian), and is used to keep order and discipline within the Chinese Buddhist Sangha. Within the Ch’an Buddhist monastic temple tradition (禅林 – Ch’an Lin), this device is referred to as the ‘Fragrant Board’ (香板 – Xiang Ban). This is a wooden board that is long and broad in structure, although its size, shape and weight often varies. However, generally speaking, the wooden sword is around two-feet long, and is wider at its base (usually two-inches wide) just above the handle. As it is used for a number of distinct purposes, it possesses a number of different names, and this explains why its size and shape varies. As a method of keeping the Dao (道) of order and clarity, it is known as the ‘Official Method Fragrant Board’ (警策香板 – Jing Ce Xiang Ban). As a method for disciplining offenders (who have broken the Vinaya Discipline), it is known as the ‘Clear Rules Board’ (清规板 – Qing Gui Ban). As a means of clearing a befuddled, confused, or fatigued mind experienced during seated meditation practice, it is known as the ‘Patrolling Fragrant Board’ (巡香香板 – Xun Xiang Xiang Ban). During a Ch’an Week Meditation Retreat, it is known as the ‘Supervisory Fragrant Board’ (监香香板 – Jian Xiang Xiang Ban). The Head Monk (方丈 – Fang Zhang) uses the ‘Fragrant Board’ (香板 – Xiang Ban) which is two-feet long, and which is used as a symbol of authority to both represent and enforce the order of the ‘Dao’ throughout the Ch’an monastic community. He does this through keeping the qi (氣) energy free-flowing through the minds and bodies of the individual members of the community by keeping the ‘Three Gates’ (三关 – San Guan) open. The Senior Temple Monk (班首使 – Ban Shou Shi) holds a subordinate position to the Head Monk (who is often referred to as ‘Abbot’ in Western discourse), but in fact holds a considerable amount of real power, as he takes care of the everyday functioning of the Ch’an monastic community. He uses a ‘Fragrant Board’ (香板 – Xiang Ban) which is one foot, nine and three-quarter inches long, and used to uphold generally accepted Official Methods (警策 – Jing Ce) of correct procedure (and behaviour) in the Ch’an monastic community. The ‘Supervisory Fragrant Board’ (监香香板 – Jian Xiang Xiang Ban) is one foot, nine and a half inches long, and is used to guide and influence the Ch’an monastic community to behave in a correct manner that is conducive to the maintenance of peace and tranquillity. The monastic in charge of the ‘Meditation Hall’ (禅堂 – Ch’an Tang) and similar other duties (such as keeping the rules of monastic discipline [清规 – Qing Gui], and the rules of behaviour and decorum in the meditation hall [堂规 – Tang Gui]), is referred to as the ‘Wei Na’ (维那) which is the Chinese language transliteration of the Sanskrit term ‘Karmadana’. This post can be further described as ‘Master of Behaviour and Distribution’, as he also ensures that all the commodities required to circulate efficiently throughout the Ch’an monastic community, are distributed properly, and the monks, although living frugally, are nevertheless adequately supplied. Master of Behaviour and Distribution can use a ‘Fragrant Board’ (香板 – Xiang Ban) of varying length (mentioned above), depending upon the context of the rules being enforced. The monk in charge of the reception room – the Reception Master (知客 – Zhi Ke) – uses a ‘Fragrant Board’ (香板 – Xiang Ban) to guide (and protect) the newly arrived monastics, which measures one foot, nine inches long. There are two of these fragrant boards situated either side of the Buddha statue in the Reception Room. On one fragrant board is written the characters ‘知客’ (Zhi Ke) or ‘Aware of Guest’ and on the other is written ‘僧值’ (Seng Zhi) or ‘Monk Value’. The Ch’an master in authority uses the fragrant board to strike (lightly) a dozing monk sat in meditation on the right shoulder. If the monk does not respond, the striking technique is intensified. The receiving monk acknowledges his gratitude for this guidance by bringing his palms together in thanks. The Ch’an master holds the sword horizontal at all times (in a respectful and natural position) unless being deployed for the downward, diagonal strike. A monk can also request the ‘strike’ to his shoulder by raising his hands together at face-level. This controlled behaviour initiates this medicalised ‘strike’ for clearing the mind and refreshing the body. The fragrant board can be used during morning recitation, the question and answer sessions with the Head Monk (or other teachers), and during the Ch’an Week Retreats. This discipline is enforced by the monk in authority given the context of the event, as explained above. The mind is ‘stilled’ by following the rules correctly (定中警策 – Ding Zhong Jing Ce), and the fragrant board is an important element that assists in this process. During the Ch’an Week Retreat, the Master of Behaviour and Distribution patrols the meditation hall and administers the fragrant board whenever it is requested, or whenever a participant appears to be falling asleep. The presence of the fragrant board reminds all participants of the seriousness and urgency of the situation at hand, and how an individual must commit themselves to an immense effort of will and concentration (as if one’s life depends upon it). The fragrant board represents the guiding quality and strictness of the Vinaya Discipline which must be self-applied and self-upheld. The fragrant board is a compassionate aid to meditative concentration and the transcendence of human (and non-human) suffering. The fragrant board is not a punishment, even though it is an aid to discipline. The monk in authority is motivated by compassion to help all the monastics impartially and with a mind free of any ulterior motive. There are eight behaviours in the meditation hall that trigger the use of the fragrant board, which are 1) if the head is seen to slightly nod, 2) if the hands and fingers start to move, 3) quietly whispering, 4) laughing, 5) snoring, 6) body leaning forward in sleep, 7) torso moving backward and forward, and 8) lack of dynamic concentration. These are the issues the monk in authority has to be aware of, and take action against for the stability of the Ch’an monastic community. This is a method of upholding the Dharma by all the Ch’an masters, who each take their turn carrying and using the fragrant board for the betterment of the entire Ch’an monastic community.